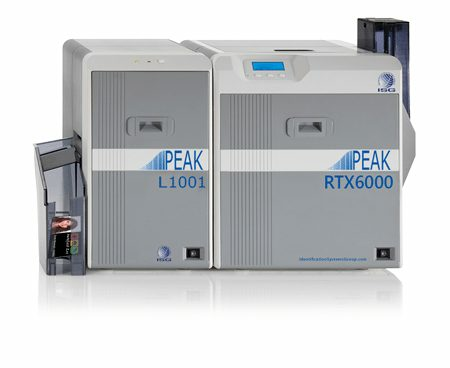 The Peak RTX6000 Printer is the high-end model of the proven Peak series of retransfer printers. The dominant feature of this version is the ultra high resolution of 600 dpi. This extremely high resolution is perfectly serving the increased security printing demands in ambitious ID Card applications, such as National ID programs, Drivers License Programs and similar. Since most of these projects are requiring the personalization on both sides of the card, the RTX6000 already comes with a factory built-in flipper module in the standard model. The ultra high resolution of 600 dpi allows printing crisp, tiny characters, down to a character size of .75 pt. Electronic fine-line printing and other sophisticated graphical elements can be printed in exciting, nearly equal to pre-printing, quality. The RTX6000 can be configured to meet your individual requirements and needs. Optional magnetic stripe, IC contact and smart card encoding is possible for further demands on card functionality. Extend the lifetime and security of your cards by joining the printer with the ISG Inline Lamination Module for single-sided lamination. Diverse security features such as electronic security lock, Kensington-lock, dye-sublimation UV ink ribbon for invisible security printing, IPSEC for encrypted data transfer through networks, and Security Erase of black data on used supplies help to secure the environment and cards from counterfeiting and to avoid misuse of personal information.